After a rough 2016, Samsung appears to be back on track. 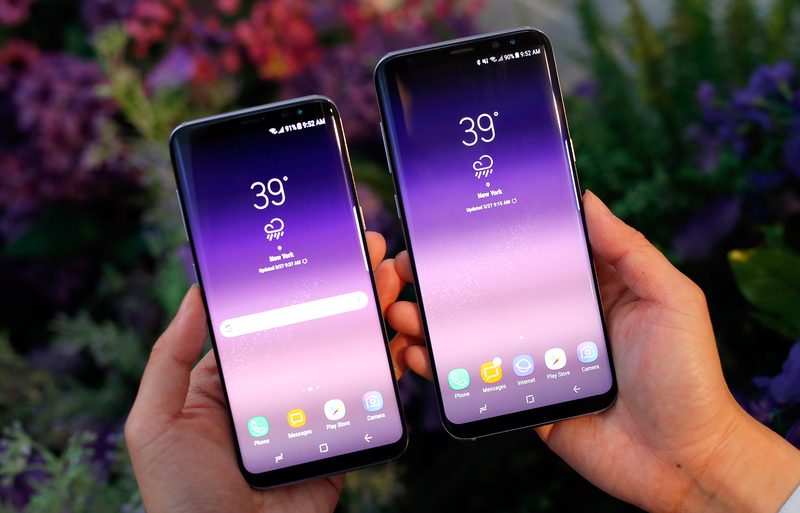 Samsung officially revealed the new Galaxy S8 and S8+ here in New York, and it seems safe to say that we got what we expected. The lack of a home button; the new AI assistant; the near bezel-less, curved screens; the rear-mounted fingerprint sensors -- all the leaks were true. 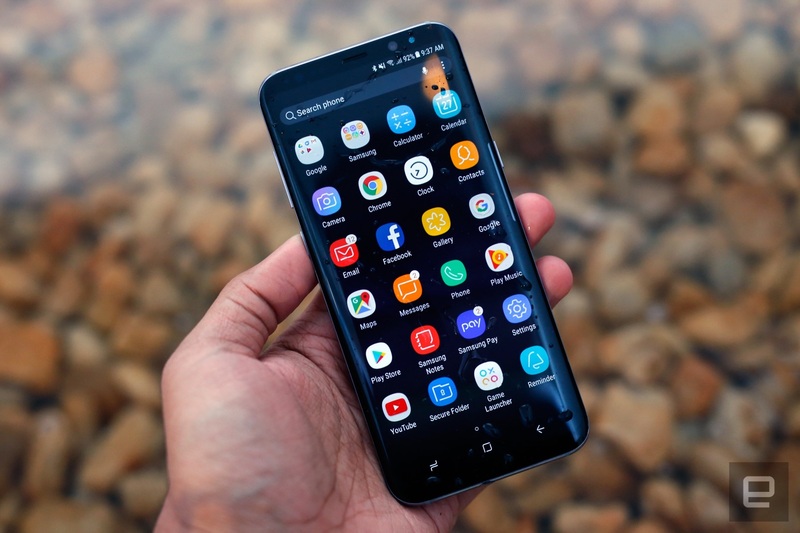 What ultimately matters more than the lack of surprises are ambition and keen execution, and Samsung clearly embraced both when building the S8s. It's a good thing too: After the Galaxy Note 7's rise and fiery fall, Samsung needed to prove that it could craft some flawless smartphones. Well, I'm not sure about flawless, but the S8 and S8+ are both gorgeous and full-featured -- for now, the good certainly seems to outweigh the bad. I can't overstate how gorgeous the S8 and S8+ are. 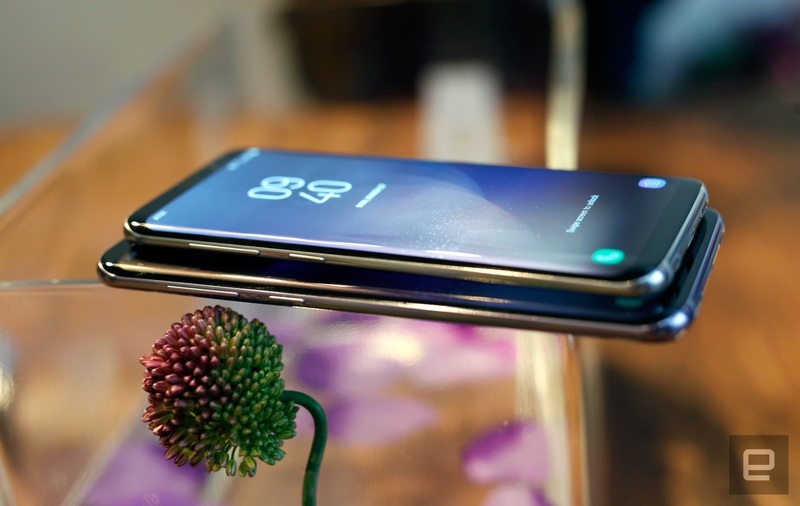 The former packs one of Samsung's beautiful 5.8-inch "infinity displays" -- that's a Super AMOLED screen that wraps around the phone's curved front to the point where it almost touches the metal band running around the device. As the name implies, the S8+ has a larger display; we're talking 6.2 inches from one diagonal corner to another. Both run at what Samsung calls Quad HD+ resolution, otherwise known as 2,960 x 1,440, since these screens are longer than normal. All the leaked renders and photos don't do these phones justice: The look might feel understated, but the fit and finish are incredible. Remember how the front and back edges of the Note 7 melted into the metal frame running around the phone without a rough seam to be seen? Well, the effect here is similar but much more striking because of how round the phones feel now. I developed a bit of a crush on the Honor Magic for its sleek, curved lines, and the S8s have a similar vibe going. As you might have already known, the US Galaxy S8 and S8+ will feature one of Qualcomm's octa-core Snapdragon 835 chipsets, along with 4GB of RAM and 64GB of internal storage. Versions available elsewhere will have one of Samsung's octa-core Exynos chips in lieu of Qualcomm's stuff, which will be a bummer for some people and old news for others. (The Exynos-equipped Galaxy S7 seemed to have a few advantages over the US, Snapdragon 820 model, but we'll see if that shakes out the same way this year.) Both devices also have 12-megapixel, dualpixel rear cameras with an f/1.7 aperture, which, yes, are very similar to last year's S7 cameras. That said, Samsung has apparently changed the way photos are processed, which should make for slightly better colors and clarity throughout. More importantly for our uber-vain generation, the S8s have an improved front-facing camera: an 8-megapixel sensor with autofocus and the ability to shoot wide-angle selfies. 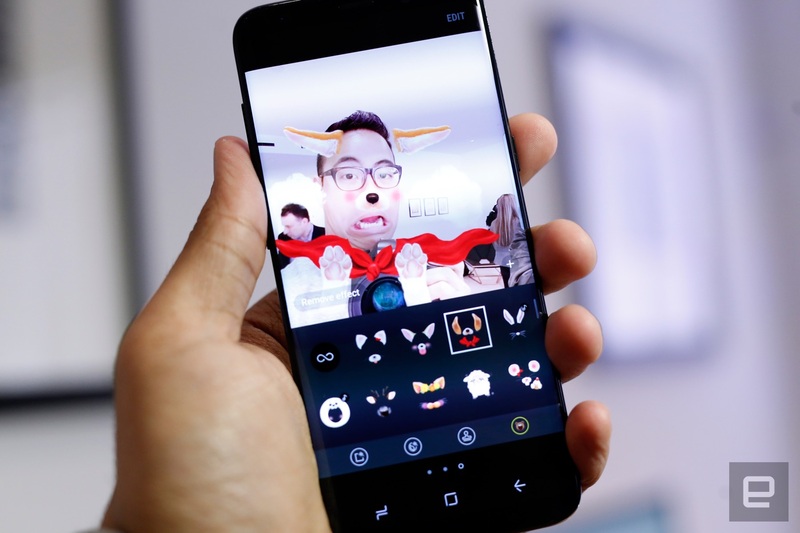 In a nod to apps like Snapchat, Snow and countless others, Samsung has included goofy filters and stickers to festoon your photos. The stickers are fine, but some of these filters straddle the line between hilarious and horrifying. It's also nice to see that Samsung hasn't given up on old fan-favorite features. Both the S8 and the S8+ still have headphone jacks, along with microSD card slots that take up to 256GB of extra storage for now. (There are bigger microSD cards, but Samsung has only certified cards as large as 256GB.) And all of you should be glad that the phone is still water- and dust-resistant, features that not all 2017 flagships have embraced. 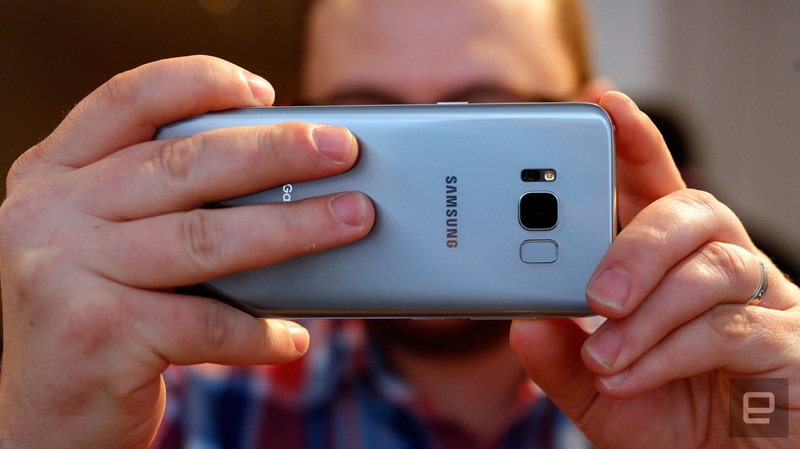 Depending on your taste, not every change here is a step forward from the Galaxy S7. The S8's fingerprint sensors are on the back, to the right of the camera, and reaching them with your index finger can still be a little awkward. Are the batteries going to explode? For everyone's sake, we hope not. Earlier this year, Samsung announced a slew of new testing methods and safety standards meant to ensure the Note 7's failures weren't repeated. Concerns over potential battery issues could partially explain why the S8s don't have bigger batteries than last year's flagships. In fact, while the S7 and the S8 both have 3,000mAh batteries, the S8+ actually has a slightly smaller 3,500mAh battery compared to the S7 Edge's sealed 3,600mAh cell. What are they like to hold and use? The phones we played with weren't final, but they were still impeccably crafted. There's barely any bezel between the S8's beautiful, mobile HDR-certified screen and the rest of the phone's body. That's a feat this device shares with LG's new G6, but the approaches couldn't feel more different. If the G6 is a flat slab of stone, the Galaxy S8 is a polished river rock, and it's all the more comfortable as a result. The larger S8+ is as impressive to hold and feel, and it fits neatly into small pockets without trouble. Sure, this screen might not be quite as pixel-dense as the smaller S8s, but there's no way most people would be able to tell. More importantly, this might be the most comfortable big phone I've ever held. The iPhone 7 Plus I usually carry felt like a whale by comparison. The combination of Qualcomm's new chip and a seemingly lighter new version of TouchWiz mean the S8 and S8+ feel incredibly fast. The updated interface, by the way, is pretty gorgeous; it's not quite as loud as previous iterations, and the subtle new icons, fonts and widget choices make TouchWiz feel more mature. It takes a little more time to get used to the new home button. The physical key (and the capacitive keys that used to flank it) are gone. Instead, you have a small, pressure-sensitive strip of screen at the bottom that you can press while on any screen to jump to the homescreen. You just have to know the home button is there, even when you can't see it. Since both the S8 and S8+ have curved-edge screens, there's no real need for an Edge model anymore. 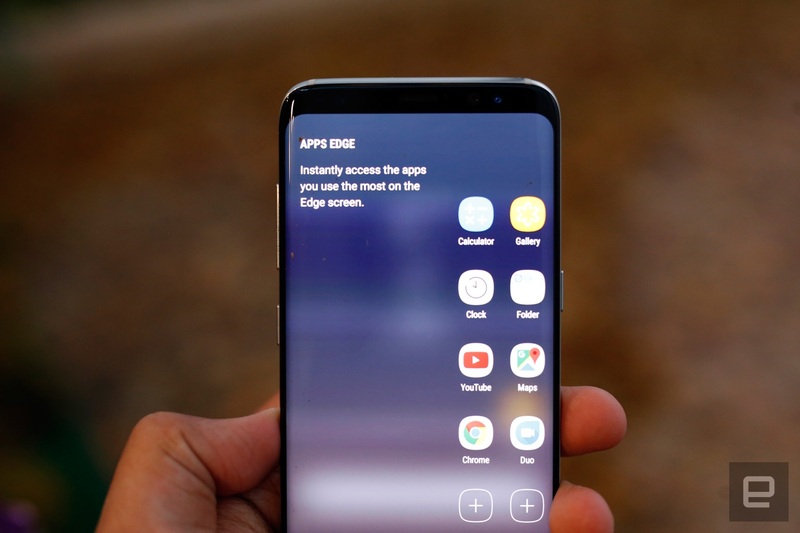 It makes sense that all of those Edge shortcuts, like app, contact and news panels, have been built into both versions of the S8. I'm still not sold on their usefulness, but it's nice to know they're around, waiting. I haven't had the chance to benchmark these things, but even unfinished, I couldn't get them to hiccup or stutter. For now, in terms of design and performance, the S8 and S8+ consistently impress. What's up with this Bixby AI assistant thing? To tell the story of the Galaxy S8s is to tell the story of Bixby, the virtual assistant Samsung has been working on for years. You can invoke ... him? her? it? ... by hitting a button on the S8's left side or saying its name aloud. 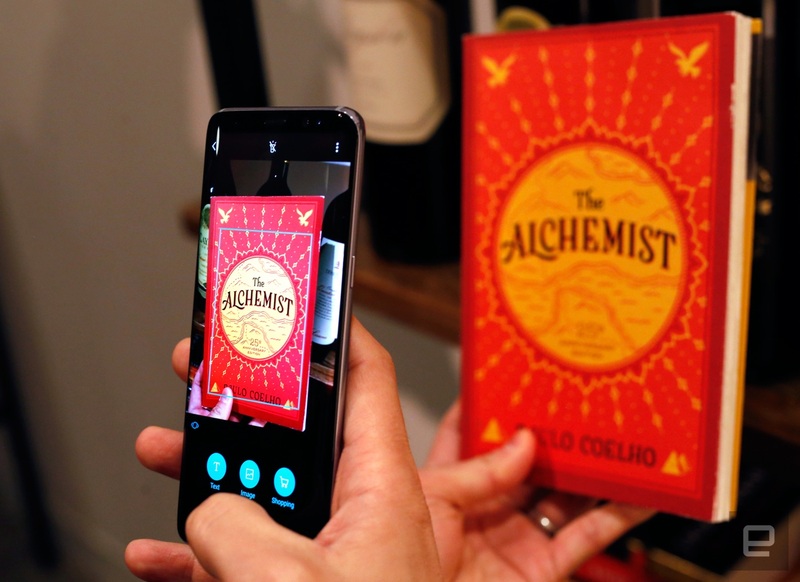 Samsung's plans are ambitious: You'll eventually be able to control the phone with your voice as capably as you could by tapping the screen, a feat most existing assistants can't pull off. To be clear, there are some big differences between the version of Bixby I played with and the version you'll see when the phones go on sale next month. When Bixby launches you'll be able to ask it for photos from your last trip to Hong Kong or to open apps. 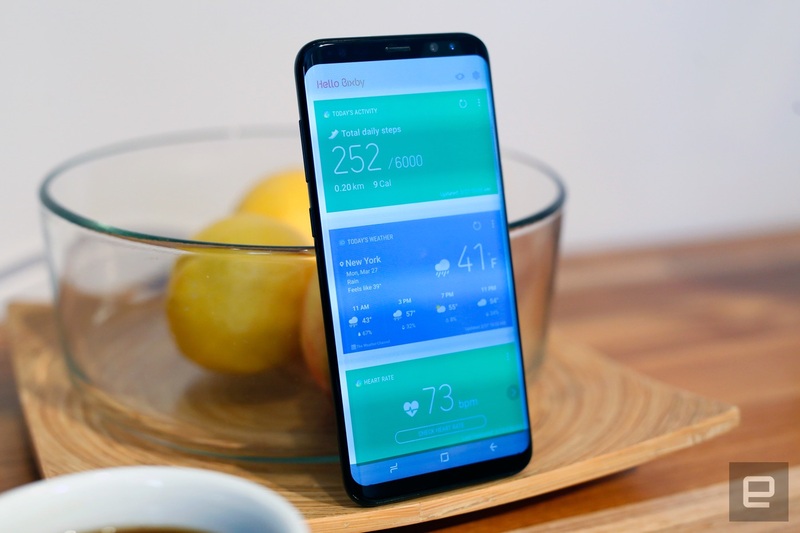 Bixby will also live on your homescreen, tracking your steps and offering suggestions to you when it starts to understand your behavior. Do you call certain people at the same time every day? Expect Bixby to notice and remind you. The S8s I played with weren't quite that far along, but Bixby Vision actually worked pretty well. In a way, Samsung is trying to make the new S8s the center of the connected home. 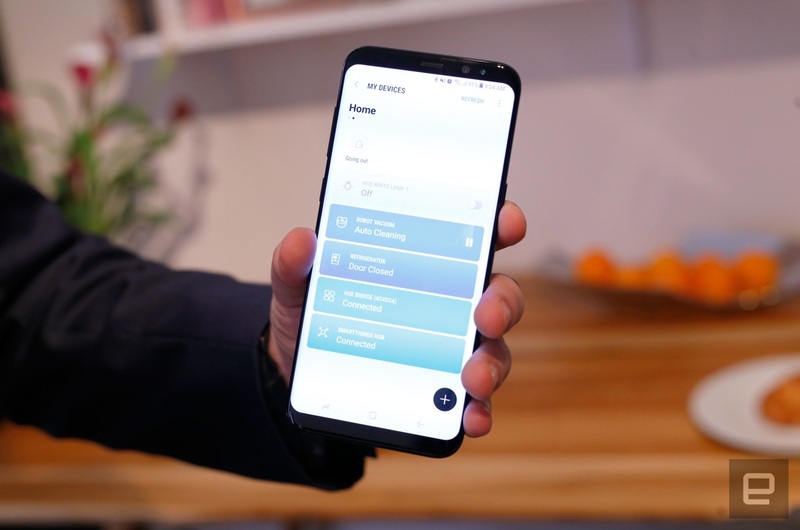 A new application called Samsung Connect lets you control or monitor all of your Samsung connected devices (of which there are now quite a few). Same goes for any third-party, SmartThings-compatible device that's tied into a network of smart home gadgets. Additionally, Samsung cooked up a system called DeX. Tell me if this sounds familiar: You plop the phone in a dock; connect a monitor, keyboard and mouse; and get stuff done on a phone-powered desktop. I've seen so many other companies try this and frankly screw it all up, but I spent half an hour playing with the demo station Samsung had set up for me. Here's a deeper dive on DeX for you, but Samsung's hybrid approach to Android on the desktop seems surprisingly usable. Consider me cautiously optimistic. That even these non-final phones were oozing with polish and poise is a testament to how important Samsung believes they are. After all, these are Samsung's attempts at redemption: It couldn't afford to build anything less than excellent. We'll have a full review for you soon, but this much seems clear: While memories of burning Notes still linger, Samsung seems to be right back on track.